Mort Kunstler Limited Edition Giclee on Canvas: "Soldier of Faith"
Image size (inches): 22" x 29"
About the Print: Those who personally knew General Robert E. Lee agreed that faith was the foundation of his life. ?In sunshine and in storm, in victory and in defeat,? observed General John B. Gordon, ?his heart turned to God.? A challenging childhood, the discipline of military life, the burden of command, the hardships of war ? all were tools of grace that shaped and reflected the faith and character of Robert E. Lee. In February of 1864, while in winter camp near Orange, Virginia, Lee was visited by a delegation of army chaplains. ?I can never forget my first interview and conversation with General Lee on religious matters,? recalled the Rev. J. William Jones, who was one of the chaplains. ?As we began to answer his questions about the spiritual interests of the army, and to tell of that great revival which was then extending through the camps?he expressed his delight [and] we forgot the great warrior, and only remembered that we were communing with 'a humble, earnest Christian.'? As the chaplains left Lee?s headquarters, one reminded the general that countless soldiers and civilians prayed for him daily. ?The old hero?s face flushed,? Chaplain Jones recalled, ?tears started in his eyes, and he replied, with choked utterance and deep emotion: ?Please thank them for that sir ? I warmly appreciate it. And I can only say that I am nothing but a poor sinner, trusting in Christ alone for salvation.?? For Lee, it was a typical statement that reflected his humility and his abiding personal faith. Said one who knew Lee the soldier: ?He was a foe without hate, a friend without treachery, a soldier without cruelty, a victim without murmuring?and a man without guile.? The lasting legacy of Robert E. Lee would be measured for generations to come not by military genius alone, but also by the caliber of his character and the fruit of his faith. I was visiting an art gallery in Virginia, when a delegation of town leaders from Orange, Virginia introduced themselves and asked me to consider painting a historical scene from their community. Although I was deeply complimented by their confidence in me, I knew I had years of commitments ahead of me. As politely as possible, I tried to explain my inability to grant their request. They received the news graciously ? and warmly invited me to visit Orange someday. As I studied the war and worked on other paintings, I noted that Lee?s Army of Virginia spent the winter of 1863-64 near Orange. Later, as I was mulling over ideas for a new snow print, I recalled Lee?s winter there and decided to see for myself what the folks from Orange loved so much about their history. In June of 2002, I arranged a visit. The town of Orange, I discovered, was a delightful place and was rich with Civil War history. I met with Jay Harrison, Executive Director of Orange Downtown Alliance, Inc., local history expert Frank Walker, and others from the Orange delegation that had called on me years earlier. I examined historic maps and studied period photographs, and became fascinated with several existing period structures. The historic Orange County Courthouse is a wonderful structure ? an excellent setting for a painting. Then I saw St. Thomas's Episcopal Church. The courthouse would have to wait. I realized instantly that St. Thomas's ? which has changed little since the war ? would be the perfect setting for a snow scene with Robert E. Lee as the central figure. Lee?s army was in winter camp nearby during the winter of 1863-64, and the general prayed at the church regularly. His church pew is preserved and designated by a bronze plaque today, and an ancient locust tree outside had been the ?hitching post? for Traveler. 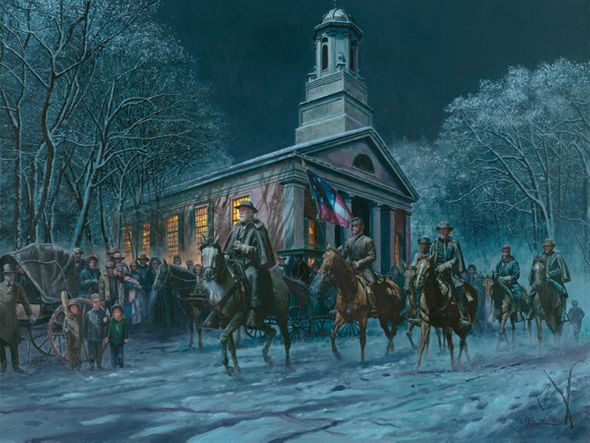 From my friend, Civil War historian Dr. James I. Robertson Jr., I learned that heavy snow fell on February 15, 1864, so there would have been snow on the ground during Wednesday vespers. It was the ideal setting for a nighttime snow scene of Lee and his place of worship that winter. I?ve always admired Lee?s character, which was, of course, founded on his personal faith ? as another historian-friend of mine, Rod Gragg, has noted in his book Robert E. Lee: A Commitment to Valor. So, I decided, what better setting for a painting of Lee than St. Thomas's Episcopal Church in Orange, Virginia?